Introducing the BRAND NEW SS396.com mobile website! We have added additional features to make it easier than ever to find what you need! To celebrate the launch of our new mobile website we’re offering you a 10% discount on all DISCOUNTABLE items to try it out! NO MINIMUM PURCHASE REQUIRED!! 12 HOURS ONLY! Hurry!! The new website is here to stay but saving 10% off your order will only last 12 hours! For example; Spend anything on eligible discountable items and get 10% off that item. No minimum purchase is required for the coupon to apply. 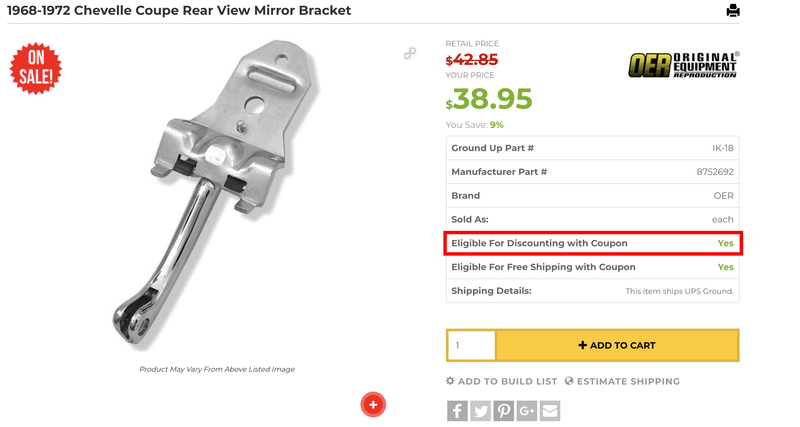 YOU MUST APPLY THIS COUPON BEFORE COMPLETING CHECKOUT. Promotion valid 11-14-18 9am est. to 11-14-18 at 9pm est. Coupon expires 11/14/18 at 9:00 pm est. MW10 coupon codes valid 11-14-18 at 9:00am to 11-14-18 9:00pm est!